The startup awards organized as part of the Energy for Smart Mobility Forum (E4SM) 2019 attracted 34 applications, including 6 from foreign countries (Germany, India, 2 from Poland, the Netherlands, Senegal). 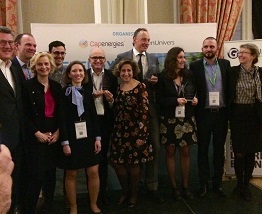 The organizers, Capenergies and GreenUnivers, selected 18 companies, including a Dutch and a Polish company, who pitched on March 14 before a jury of experts. Among all these candidates, the jury selected 4 startups specialized in energy solutions for electric mobility and hydrogen. easyLi won this category thanks to its harware and software concept of onboard energy systems adaptable to different models of electric vehicles (EV). In the early stage of commercializing its products, the startup facilitates the rapid and low-cost deployment of mobility services, without traditional charging infrastructure. Created in 2011, the company from Châtellerault (Vienne) is looking for partners and clients. The winner is Gulplug from Grenoble created in 2014, with its original charging system called Selfplug. This automatic electrical equipment can be plugged into any standard power outlet and allows all EV, even autonomous, to be charged. Selfplug is currently in the R&D stage with prototypes being tested by vehicle manufacturers. Moreover, an automotive supplier has entered into a partnership. The hydrogen was awarded to the HySiLabs engineers. Their process, developed since 2015, uses hydrogen as a liquid carrier to accumulate energy, with applications in mobility and storage, among others. The density of the liquid is announced 7 times higher than what generates the high pressure. After the prototype phase, the Aix-en-Provence startup plans to set up a pilot plant within two years. On the commercial side, HySiLabs explores licensing the model and associated know-how. The jury awarded its “coup de coeur” prize to GreenFlux. Since 2011, this Dutch company has been implementing the most open vision possible for EV charging, for networks, electricity suppliers and automotive manufacturers. GreenFlux already has customers and counts several well-known partners, such as Total, UK Powernetwork, Pitpoint, Alfen and EVBox.